Adina is a company that strives to create energy products according to two principles: healthy and natural. Specializing in coffee-based drinks, they claim to be the first to produce a coffee energy drink that preserves the benefits of the coffee beans used and deliver a whopping 4-fruit servings worth of antioxidants in each can. Seeing as they're competing against big brands like Monster and others with proven coffee-based drinks, Adina is definitely pushing their natural edge. The question is will people embrace a natural energy beverage? Adina's Coffee Energy Drink comes in 5 flavors that are very common within the world of coffee. Mocha Madness – Has a nice chocolate smell. Very smooth, watery texture, prominent cocoa flavor with a light coffee taste. This one is my favorite! Caramel Kick – The caramel flavoring isn't too noticeable. Has a watery feel to it with a bit stronger coffee taste than Mocha Madness. What really surprised me was an aftertaste somewhat reminiscent of eggnog. Double Xxpresso – A basic espresso mixed with milk and sugar. Isn't too strong and I find the sweetness and texture to be very enjoyable. Some seasoned espresso fanatics may find flaws in this mix, but I find it to be just right. Vanilla Nut Case – Subtle vanilla taste with the same texture of the other flavors. The nut flavor is also very subtle. This ends up tasting and feeling a lot like Caramel Kick. Hazelnut Hook Up – It's tough to taste the hazelnut, but it has the same sweet and smooth taste as the rest of the flavors. Although I'm picky about flavor, each of these would be very enjoyable to the casual drinker. Adina puts a lot of emphasis on the natural ingredients they use to make these coffee concoctions and they're serious about it! There is not a trace of any artificial ingredients. Each one is a simple mix of Columbian coffee, 2% milk, water, cane juice, guarana, and natural flavors. The caffeine concentration is around 100mg, which is fairly average in an 8oz drink of this size. Adina provides a very nice, natural pickup. It would best be described as a moderate boost of energy one would expect for a coffee-based drink in this size. It comes on quickly, as coffee tends to deliver that kind of an edgy pick-me-up. The best part is that it’s not too edgy. For those who want a greater lift, however, this won't cut it. A larger volume would be desirable. Adina's all natural coffee drinks are definitely worth trying. They provide a great energy boost that you can feel good about, knowing it includes only natural ingredients and a big dose of antioxidants. Sugar content: 19 grams (per 8 ounces). 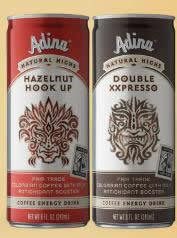 How Does Adina Natural Highs Coffee Energy Drink Compare? Adina Natural Highs Coffee Energy Drink contains 12.50 mgs of caffeine per fluid ounce (42.27mg/100 ml).